Post # 2 NASA Social ISS event at Johnson Space Center in Houston! As our shuttle pulled up to the building, excitement was evident because we all got off of our phones, our attention now drawn to getting off the bus and to the building as fast as possible! Once inside, we saw the lobby elevators leading up to the main room. 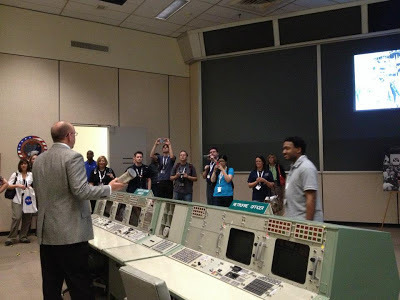 Our guides talked to us about the building itself and how Christopher C. Kraft, for whom the place is named, was a NASA engineer who helped establish the location dedicated to monitoring America's space flight. Its callsign is HOUSTON. The Mission Control Center Houston was first used in 1965 for the Gemini IV mission, the 10th manned American spaceflight. Soon, we walked around a hallway to an area where there were steps leading up into the viewer's room overlooking Mission Control! Here we met Royce Renfrew, flight director. "A flight director leads and orchestrates planning and integration activities with flight controllers, payload customers, station partners and others. All of the recently selected flight directors have previously served as flight controllers in Mission Control and will begin training as International Space Station flight directors." My panorama of this most awesome of rooms! Mr. Renfrew directed us to our seats in the viewing area overlooking the action and introduced an engineering class from Indiana University that was also visiting. He talked to us about the functions of Mission Control as well as what & who we were seeing through the window in front of us. On the left two screens, there are live feeds from different sections of the ISS showing astronauts working on the station. It's a bit hard to see in this picture, but there is someone currently working center / rear. It's amazing that so much work gets done without accidents - you can see how crowded the "hallways" are! The next image shows unix/linux feed (not sure which, sorry!) of comm data and cmd prompts of what is happening around the ISS in real time. Mr. Renfrew explained to us that sometimes, it will be in red for something urgent - such as a failed fire testing event that had happened the night before! You can see where it says smoke detector failure. Scary! The little "GO" in green is for comm (communications) time left and that it is clear. Mr. Renfrew mentioned that they try to preserve five hours of sleep time for the astronauts and that it should be uninterrupted if at all possible. The screen on the farthest right is another live feed of astronauts working. Here, you can see someone in his sock feet working and as we were listening, he must have turned upside down two or three times, concentrating on something he had in his hands, but not paying much attention to his rotation - funny! It was so interesting to see people working at their computer stations, ready to communicate with the astronauts if needed. 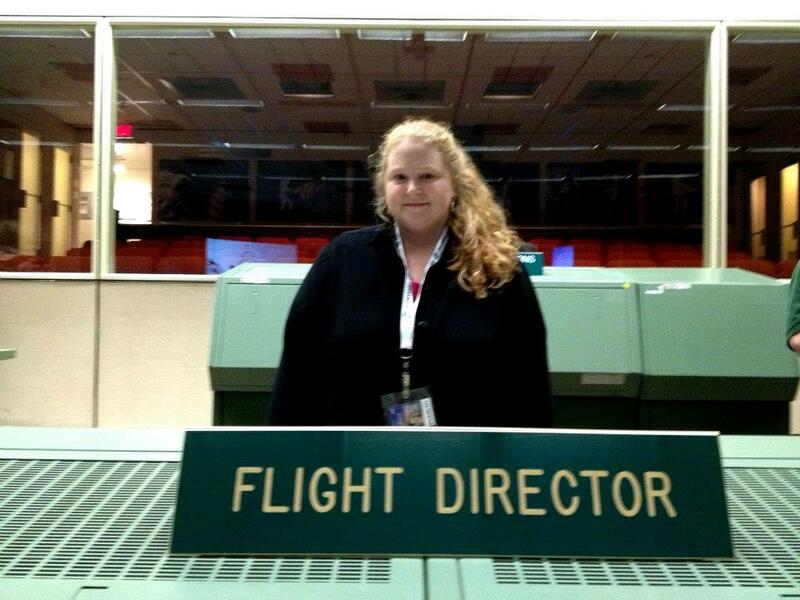 The current flight director is below. Each desk area was somewhat personalized and some had flags showing the country of the technician. Each of the 15 to 20 flight controllers who sits at a console has the help of other engineers and flight controllers monitoring and analyzing data in nearby staff support rooms. ﻿I cannot imagine being here, or in any control room for that matter, or viewing seats when an event such as the MSL Curiosity landing last August. I know that my own excitement and hope, yet stress and uncertainty at the "Seven Minutes of Terror" was enough - I cannot fathom what I would experience if I had spent more than ten years of my life on the project - the apprehension would have been insane! Our next room to visit was the historic Apollo Mission Control Room! This famous room was the flight control room for Apollo 11, the first manned Moon mission. IT WAS AWESOME JUST TO BE IN HERE! The first step on the Moon was July 20, 9:56:15 p.m. (EST), 1969. 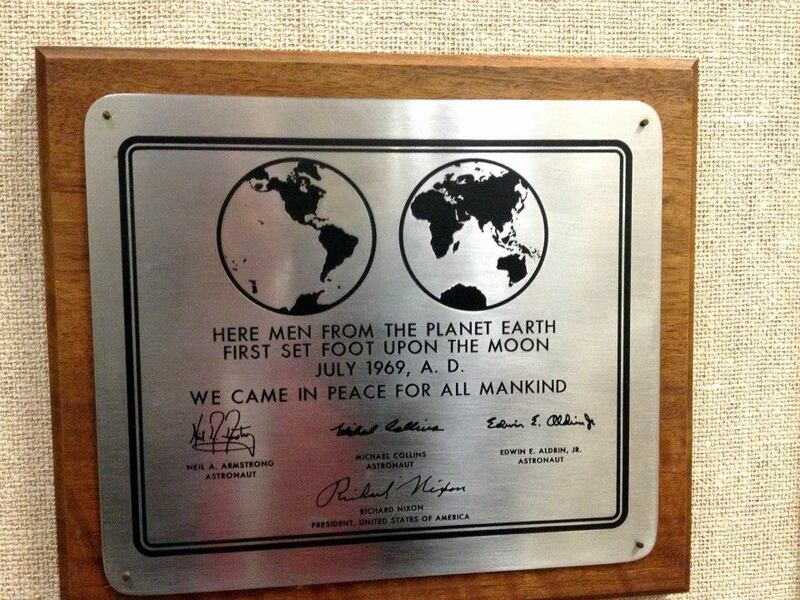 These were the first words transmitted to Earth from the surface of the Moon! Now, this room is a U.S. National Historic Landmark and in the U.S. Register of National Historic Places. The room was used until 1992 and then converted back to its Apollo style configuration for history. Decked with flags and plaques commemorating missions and people, the room also still has the red phone that had a direct line to the President! 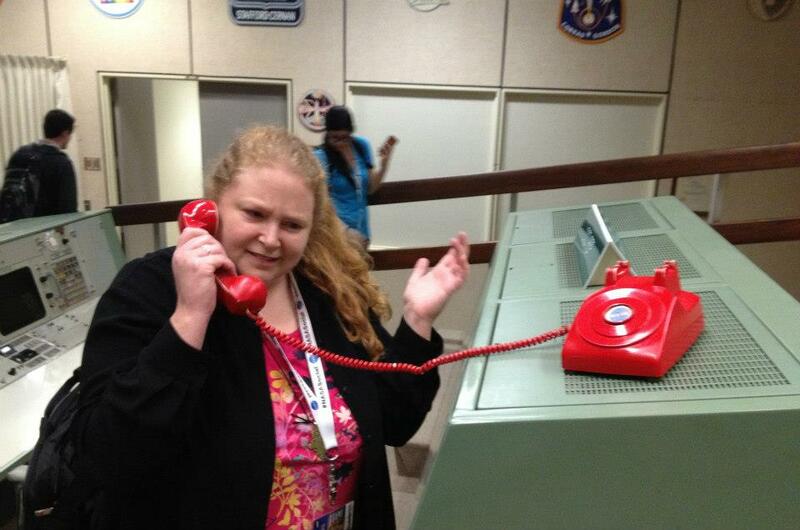 Here I am explaining that NASA needs MORE funding, NOT LESS and next to that - now I am the flight director, HAHA! It is interesting to ponder both sides of the spaceflight coin - those that are in flight and those on the ground who are additionally responsible for the lives of those in mission. There is such a delicate balance of factors that ensure safety of person and mission and such a spirit of selflessness from those undertaking spaceflight for the benefit of humanity. 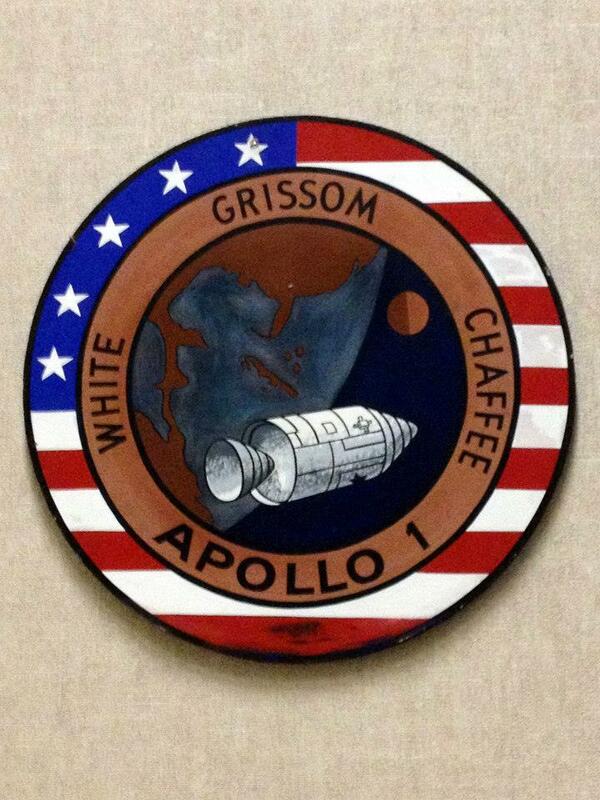 Here is a plaque in honor of Apollo I command pilot 'Gus' Grissom, pilot Roger Chaffee, and senior pilot Edward White who perished in a fire that swept through their command module during a pre-flight test. "If we die, we want people to accept it. 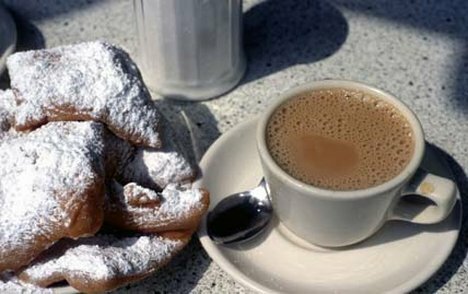 We're in a risky business, and we hope that if anything happens to us it will not delay the program. The conquest of space is worth the risk of life." My next NASA Social ISS post will be about the Space Vehicle Mockup Facility.